Smelt die botter in ‘n kastrol van 23cm. Klits eiers goed, voeg suiker by en klop tot romerig. Vou die meel liggies in en dan die gesmelte botter. Kook 20 – 30 minute oor middelmatige hitte. Versier soos jy dit wil. Dit kry nie water in nie en dit word in die kastrol gaar gemaak. My ma het altyd die deeg in 'n koekpannetjie bietjie kleiner as kastrol gegooi en dan in kastrol gesit om te bak. Werk soos 'n oond. Make a hot fire and place your empty pot on the grid, with the lid on. Butter the cake tin so that the cake won’t stick to it. Mix all the dry ingredients together very well with a whisk or wooden spoon. Mash the banana with the syrup, add to the dry ingredients. Add the rest of the liquid ingredients and blend well, adding the vinegar last. Pour the batter into the cake tin and place the tin onto the wire rack inside the hot pot, covering again quickly with the lid to retain the heat. Check every 10 minutes by opening the lid a crack and peeping inside; the cake should take about 30 minutes to cook. After 30 minutes remove the pot from the fire and test the cake by poking it with a sharp knife – if the knife comes out clean, the cake is baked. If not, leave the lid on for a while longer, but keep it off the fire. It should finish cooking inside it’s make-shift oven. Cool and then cover with tinned Caramel Treat, or just dust with a bit of icing sugar – you can even just eat it plain or with some custard! Meng al die bestanddele goed saam, behalwe die goue stroop. Bak in ‘n pan met olie op matige hitte en gooi stroop of heuning oor sodra gaar is. Voeg die kondensmelk en die helfte van die fyngemaakte sjokolade by en roer liggies. Moet dit nie weer klits nie, want dan sal die room loperig raak en nie behoorlik set nie. Sit die koekies in ’n verwerker en blits tot dit soos broodkrummels is. Maak ’n laag van koekiekrummels in jou gekose bak. Versprei die helfte van die roommengsel oor die koekies en bestrooi met ’n bietjie sjokolade. Skep nog ’n laag koekiekrummels en room en bedek met die oorblywende sjokolade. Verkoel minstens 6 uur sodat die nagereg kan afkoel en set. CAMPFIRE ORANGE CAKES:This is so much fun! 1 box Vinilla or Yellow Cake Mix, or other cake mix that only requires water -- try chocolate or gingerbread too!! Prepare cake mix per instructions. Fill each orange half full of cake mix. Place their lids back on and wrap in foil. Bake in hot coals or on grill about 20 minutes, turning often. When the cakes are done you may eat them with a spoon or peel your orange and have a hot orange cake. As jy ooit gedink het die kampyskas is te klein om ordentlike yskastert te maak, lees 'n bietjie hier. 1 Meng die kondensmelk en suurlemoensap en laat staan dit tot dit dik word. Vou die room, pynappelstukkies, malvalekkers en jellie by. 2 Pak die Tennis-beskuitjies in klein bakkies en gooi ’n bietjie van die mengsel bo-op. Pak nog ’n laag koekies en gooi nog van die mengsel daarop. Jy kan die proses so drie keer herhaal, afhangende van hoe groot jou bakkies is. 3 Sit die bakkies in die yskas tot hulle gestol is. Dan is dit tyd vir voorsit – as jy wil ghrênd wees, sit glanskersies bo-op. Week beskuitjies vinnig in koue koffie. Dan dun lagie versiersuiker en dan lagie room. Rasper Peppermint Crisp oor elke lagie room. Versier met vermicilli of peppermint crisp. Rol Swiss roll met konfytkant na bo op in bak. Meng kondensmelk, maaskaas en suurlemoensap. Smeer egalig oor die Swiss roll. Pak skywe perskes bo-op. Kook stroop van perskes en vlapoeier. Gooi oor die tert en laat in yskas vir 1 uur. Skep klein balletjies van spanspek uit (genoeg balletjiesom om bo-op die tert te plaas) . hou eenkant. Krap oorblywende spanspek uit en puree met suiker, lemoenskil- en sap. Week gelatien in koue water op . smelt oor warm water . voeg by spanspek puree. Roer Nestleroom in, gooi in voorbereide kors. Plaas in yskas tot gestol. Net voor opdiening, rangskik balletjies bo-op gestolde spanspek. Meng Cointreau en lemoensap en borsel bo-oor balletjies . versier met gesifte versiersuiker . bedien dadelik. 1. Preheat oven to 350 degrees. Melt butter in an 8 inch cast iron skillet set over medium-low heat. Stir in sugars and vanilla and remove from heat. Let rest until pan is warm, but no longer very hot, about 5 minutes. 2. Crack an egg onto the butter and sugar mixture, and use a fork to whisk it well into the mixture. Place flour, baking soda, and salt on top, and very carefully stir into the mixture until smooth and well-mixed. Stir in chocolate chunks. Place in the oven for 15-20 minutes*, or until starting to turn golden on the top and around the edges, but soft in the center. Serve with vanilla ice cream. * As many readers have pointed out, cooking time can vary greatly. When I doubled this recipe, for instance, I made it in a larger pan, and the cooking time was probably around 35 minutes. Also, it will depend on how hot your pan is when you put it in the oven, the size of it, and how well it conducts heat. When you’re making it, judge the cooking time according to the doneness of your preference. You may have to wait a little longer than the recipe says, but you won’t be sorry. Kan ook met gemak buite by die vuur gemaak word. 1.Preheat the oven to 325 F. Place cast iron skillet on stovetop burner. 2.Cut butter into 6 chunks and place in skillet with the chocolate. Cook over very low heat, stirring occasionally with a wooden spoon. 3.Because the heat is low, it can take some time, so measure out your other ingredients while it's melting, so you aren't tempted to turn up the heat! 4.When the chocolate and butter are completely melted, remove pan from the heat and add both sugars. Stir until everything is combined. 5.Add eggs, one at a time, stir well after each addition. 7.Add flour and salt and stir until there are no traces of flour left. 8.Use a rubber spatula around the edge of the pan to clean off the sides and get all the batter into the middle. 9.Place skillet in the oven and bake for 50 minutes. Insert a toothpick into the center to test for doneness. Toothpick should come out clean, with the possibility of a couple of crumbs. If it's still wet, put back in the oven and bake at 5 minute intervals. 10.Allow to cool on a wire rack for about 15 minutes. If you like warm brownies with ice cream and chocolate sauce (mmmmmmm! ), cut a wedge now. :) Otherwise, cool brownies completely before cutting into wedges. Kan met gemak buite by vuur gemaak word. Lay the biscuits close together over the bottom of a lightly greased pie dish. I use a rectangular dish as the biscuit shape lends itself to a rectangular or square dish. Place condensed milk, boiling water, vanilla, zest and butter into a medium sized saucepan over medium heat and bring to the boil. In the meanwhile, mix together the cornflour and cold water to make a paste, add the two egg yolks and salt and whisk together. Remove the saucepan from the heat, whisk in the cornflour egg mixture then return to a low heat and keep whisking or stirring quickly until the mixture has thickened. It happens quickly. Beat the egg whites in a clean metal bowl until stiff peaks form then fold the egg whites into the hot mixture. Pour the filling over the biscuit base and allow to cool then place in fridge to cool and set completely. Sprinkle ground cinnamon over the top and serve. Ons kamp ook gereeld. Ek het 'n baie maklike tert wat ons nogal gereeld maak. Meng die kondensmelk en piesang. Pak die tennisbeskuitjies in 'n bak, gooi die helfte van die kondensmelk en piesang mengsel op die beskuitjies, pak weer 'n laag beskuitjies en gooi die res van die mengsel bo-op. Sit in yskas en laat stol, sit voor met room. Dit is heerlik, ek sal alleen so 'n bak terk opeet. Giet mengsel bo-oor kors en plaas in yskas om te stol. Cover the raisins with boiling water and set aside to soak. Whip the cream, stir in the caramel condensed milk and add the vanilla and rum essences. Drain the raisins and add to the cream mixture and mix with a wooden spoon. Arrange a layer of biscuits in a medium pie dish that holds 1,5l (6 cups) and spoon a layer of the filling on top. Repeat the layers and scatter a layer of biscuits crumbs over the last cream layer. Chill the tart in the fridge for 2–3 hours or until set. Jou gunsteling Beskuitjies vir die Kors. Voer jou tert bak uit met die beskuitjies. Die mengsel het vir my twee gegee van so ongeveer 230mm x 230mm. Klop die Orley Whip baie styf. Klop die Kondensmelk en Ideal Melk saam. Jy moet vinnig werk want die mengsel sal gou begin stol. Vou nou die Maroela Konfyt in die mengsel in. Laaste vou jy die Orley Whip in. Jy kan sekerlik die Orleywhip vervang met varsroom en die Ideal Melk met Roomkaas. Ek het gebruik wat ek het omdat ek die tert darem bietjie minder sondig te maak. Jy kan ook 'n ander geur Poeding gebruik maar onthou as jy dit doen gaan jy die smaak verander. Die Maroela Konfyt het 'n baie subtiele smaak en kan maklik oordonder word. As jy roomkaas gebruik kan jy gerus maar so 160ml Amaroela Likeur ook bygooi. 400g peppermint crisp chocolate, grated. 1. Place tennis biscuits in a dish that can fit in your fridge. 2. Mix the caramel in a mixing bowl until smooth. In a separate bowl, whisk cream until stiff peaks form. 3. Add the whipped cream and 100g of the peppermint crisp chocolate to the caramel and mix well. 4. Place a generous amount of the mixture over the tennis biscuits and spread evenly. Add another layer of tennis biscuits and caramel mixture. Continue until the dish is full and remember to end it off with a layer of the caramel mixture. 5. Sprinkle the rest of the peppermint crisp over the top and place in your fridge to set. Create hot coals for the dutch oven. Line the dutch oven with foil and spray with some cooking spray. Dump the pie filling into the bottom of the dutch oven. Mix the cake mix & soda together in another bowl and pour over the cherry filling. Sprinkle pecans on top. I just covered half since we had some picky eaters. 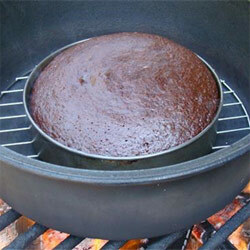 Place lid on dutch oven, cover with coals, and bake for 20-25 minutes depending on your heat. We usually use our noses to know when to test for doneness. We could really smell a strong baking smell and when we pulled it around 23 minutes. It turned out perfectly! The filling was really hot, but that didn't stop everyone from devouring it. This is NOT a posed photo below. It was so delicious that we were practically fighting over it. Yummier than made with the conventional oven! I made one in a square pan which is easier to me than trying to get it in a circle. I also peeled too many apples so I made two! Peel apples and use an apple slicer to core and slice. Sprinkle apples with a little cinnamon and brown sugar. Melt 1 stick butter about 3/4 c brown sugar and about 1 tsp or so of cinnamon. I don’t measure, so if it looks to thick add a little more butter. Take Grands® biscuits and slice in half. Alternate in a pan a couple apples then a biscuit, a couple of apples then a biscuit and so on. Pour the melted mixture over it and bake at 350º for about 30 minutes or until the apples are soft and the biscuits are baked. Mm, mm, mmm! Thanks for sharing your recipe with us Emily! Also, to make a ring more easily, just put the recipe in a bundt pan, like you do for Lazy Sticky Buns! These recipes are very similar! So be sure and check out that recipe as well! Jy kan hom ook potbood "style" bak. Hierdie is regtig baie lekker en maak 'n heerlike nagereg met room of val ook. Hierdie is weereens 'n kannie dood resept van my ouma. Syt dit altyd met verjaarsdae of Kuierhoekies gemaak toe sy nog geleef het. En dis so maklik om te maak. Dis weereens in engels vir my facebook groep. Desolve the cremora in water and leave in the fridge over nite. Or untill cremora is thickish. Beat the condensed milk and lemon juice together untill thick.. Beat the cremora untill thick and mix with condensed milk mixture. Make a base with 1 packet tennis biscuits and melted butter. Then pour mixture into the dish and leave in the fridge overnite. You can also buy a tin Strawberries of Blackberries as a topping. 1.Place 20 cookies in a gallon sized sandwich bag. Seal the bag except for one corner so air can escape and roll with a rolling pin to coarsely crush the cookies. Place cookies and butter in a large bowl. Mix with a spoon (or your hands) until the butter has been worked through. Place in the bottom of a 9x9” pan. Note: this is not a crust in the traditional sense. It’s loose and not compacted. 2.Wipe out your bowl and add pudding mix and milk. Whisk until smooth and let sit for 2 minutes. Fold in a heaping 1 cup (about 1 1/2 cups) of whipped topping. Carefully spread over cookies in pan. 3.Crush remaining cookies in a new gallon sized sandwich bag. Sprinkle half over pudding. Reserve the rest for the topping. 4.Mix lemon curd gently with 1 even cup of whipped topping. Spread over pudding. 5.Spread remaining whipped topping over the curd mixture. Sprinkle with remaining cookies. Cover with plastic wrap and refrigerate at least 8 hours before serving. Lindi Sternberg van Groenpunt, Kaapstad, verkies kook bo bak. Haar vriende is gek oor haar ongewone kookstyl met sy gesonde aanslag. Sy pas graag ou resepte aan om dit gesonder te maak. Dié soutkaaskoek was so een. Haar ma het dit gereeld gemaak. Daardie tyd is die tuna met koskleursel gekleur, maar sy verkies om dit met beet geur en kleur te gee. Sy room daarvan om ’n vegetariese bistro te begin. Voer ’n 20 cm-losboompan uit met kleefplastiek. 1.Meng die beskuitjies met net genoeg botter om dit bymekaar te hou. 2.Maak die avokado’s fyn met die sap. Geur met die skil, sout en peper. 3.Meng die tuna, mayonnaise en beet. 4.Meng die roomkaas en room. 5.Druk ’n laag krummels in die pan. Skep die tuna, dan die avokado en dan die roomkaasmengsel oor. Sprinkel krummels oor. Verkoel minstens 4 uur. 6.Ontvorm op ’n bor en rond af met die roketblare. Emmarentia Furstenber van Krugersdorp sê haar man het ’n suikertand en dié koekbrood is altyd ’n wenner. Wanneer haar man haar oor naweke met ’n braai saam met vriende verras en sy niks berei het nie, kom dié bykos altyd goed te pas. Voorverhit die oond tot 190 °C. Smeer ’n ronde oondbak met ’n deursnee van 23 cm. 1.Klits die eiers en suiker saam tot wit en donsig. 2.Voeg die botter by en klits 1 min. Sif die meel, bakpoeier en sout by die mengsel in en vou tot goed gemeng. 3.Vou die mielies in en giet die mengsel in die bak. Bak 30 min. Sit voor met spekvleis, kaas en esdoringstroop of met braaivleis. Meng krummels met botter en druk op boom van losboompan. Verkoel. Klits roomkaas en suiker. Klits jogurt daarby in. Klits room styf en voeg by. Los gelatine in warm water op en roer by mengsel. Skep oor kors. Maak suikerstroop met 125 ml water en suiker aan en verdik met mielieblom. Versier koek met kiwivrugte en verglans met suikerstroop. Verkoel oornag. Die koek kan met enige vrugte versier word indien verkies. 1.Voorverhit die oond tot 180 °C. Smeer ’n 23 cm-tertpan. Klits die botter en stroop saam en voeg die eiers een-een by terwyl jy ná elkeen goed klits. Roer die gesmelte sjokolade in. 3.Sif die droë bestanddele in ’n groot bak. Voeg die eiermengsel by en roer om ’n gladde pasta te vorm. 4.Sprei die korsmengsel egalig oor die bodem en kante van die voorbereide tertpan. Klits die eierwitte tot skuimend, voeg die vanielje-ekstrak by en klits tot stywe punte vorm. 6.Meng 125ml (½ k) van die melk met die meel, mielieblom, sout en stroop tot glad. Sit eenkant. 7.Bring die oorblywende melk tot net onder kookpunt in ’n kastrol oor matige hitte. Verwyder van die hitte en roer die meelmengsel in. Sit terug op die hitte en roer aanhoudend tot die mengsel verdik. Voeg die botter bietjie-bietjie by en meng goed. Klits die eiergele in die verhitte melkmengsel in. 8.Vou die eierwitte sagkens in. Giet in die voorbereide pan. Bak 20 minute. Laat afkoel. Strooi gerasperde sjokolade bo-oor en sit voor. Hierdie melktert kan by die kamp op jou swartpot se deksel oor die kole gebak word. Smeer deksel goed met olie of spuitwerende kossproei voordat jy die deeg op deksel sit. Sit dan foelie liggies oor die melktert en bak tot gaar. Jy kan ook 'n tertpannetjie gebruik en dit dan so bak. "Although real Chinese dinners usually end with a piece of fruit, Western influence has caused a few changes. This cake uses Chinese techniques to make a French inspired, and extremely moist, sponge cake." 1.Arrange a large bamboo steamer or a large vegetable steamer over simmering water. Make sure it is large enough to hold the baking pan. Line a 9 inch square pan with waxed paper. 2.Separate the eggs. Place the yolks in a large bowl along with the sugar and water. Beat with an electric mixer on medium speed until the mixture has increased about three times in volume. Whisk together the flour and the baking powder; sift this over the egg mixture, and fold in gently. Blend in the extract. 3.Whip the egg whites in a clean bowl to stiff, not dry, peaks. Fold into yolk base. Pour the batter into the prepared pan, and smooth out to edges. Rap the pan on the counter to get rid of large air bubbles. 4.Place the pan into the steamer. Cover the top of the steamer with a kitchen towel, and place the lid on top; the towel will absorb any steam that collects on top from dripping onto the cake. Steam for about 20 minutes, or until a toothpick inserted into the center comes out clean. Cool on a wire rack. Dust with confectioner's sugar. 1.Beat together cream cheese, zest, and brown sugar in a bowl with an electric mixer at high speed until light and fluffy, about 1 minute. 2.Whip cream and add Rum. Beat until soft peaks form. 3.Gently stir one third of whipped cream mixture into cream cheese mixture to lighten, then fold in remaining whipped cream gently but thoroughly. 4.Thinly slice bananas and arrange evenly over bottom of crust. Spread all of cream filling over bananas. 5.Chill pie, loosely covered, at least 1 hour. 6.Decorate with banana's or grated chocolate. Heerlike resepte vir kamp en braai en wenke.